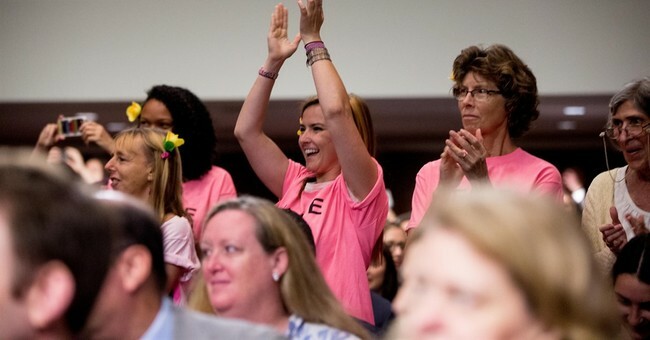 Code Pink, the controversial liberal activist group that has disrupted countless congressional hearings, has reportedly found the real culprit in the mass shooting at Marjory Stoneman Douglas High School - JROTC programs. Nikolas Cruz, the 19-year-old killer, “was an expert marksman because he was trained by the U.S. Army JROTC program,” Code Pink asserts. Of course, Code Pink has their sights on the NRA too. It's amazing we have to say this, but the NRA and the JROTC are not to blame. They did not train Cruz to kill 17 people in cold blood. Cruz, as we have learned, is a mentally disturbed young man who was already on the FBI's radar before he showed up at the school with the intent to murder. Code Pink did not mention on its campaign page that one of the heroes in the Parkland shooting was 15-year-old Peter Wang, a JROTC cadet. When the bullets started raining down on his peers, Wang stayed to hold a door open for them to escape. He was killed in the action. West Point Academy awarded him a posthumous admission in his honor. Wang was also given the Army’s Medal of Heroism, along with two other cadets, Alaina Petty and Martin Duque, who were also slain that day.